In line with the "Doing What MATTERS for Jobs and the Economy" (DWM) framework, the California Community Colleges Chancellor's Office (CCCCO) Workforce & Economic Development Division is investing funds to grow a statewide network of innovative makerspaces linked to California Community Colleges as a key partner in developing a workforce for the innovation economy. Through its InnovationMaker3 funding opportunity, the CCCCO aims to identify and network together 62 colleges committed to exploring, setting up, and/or building out their connections to the Maker movement. In addition to investment in a makerspace, grantees will be asked to plan for the creation of paid work-based learning/internship opportunities tied to student participation in the Maker environment through developing outside business/industry partners. 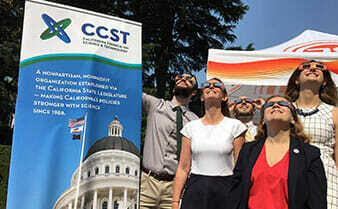 In support of this goal, the CCCCO and the California Council on Science and Technology (CCST) presented the InnovationMaker3 Symposium Series. The series was designed to bring together interested community college faculty with experts from the Maker community. Broadly, the meetings aimed to begin building the envisioned community college makerspace network and inform faculty of what is required to develop a successful makerspace. This goal was achieved by showcasing existing makerspaces in the region, as well as discussing how to connect them to the community through both educational experiences and business partnerships. Each symposium included the presentation of the recently released report: "Promoting Engagement of the California Community Colleges with the Maker Space Movement," authored by CCST. The program included a panel of experts eager to share their MakerSpace experience and provide colleges with the opportunity to ask questions, discuss MakerSpace data and metrics, and to begin developing plans for connecting their community of learning to the Maker movement and work-based learning. Each regional symposium ran from 10:00 AM - 3:15 PM, followed by an optional tour of the host institution's MakerSpace. The Northern California InnovationMaker3 Symposium was held at UC Berkeley on June 13, 2016. The symposium was presented by the California Community Colleges Chancellor's Office (CCCCO) Workforce & Economic Development Division, along with the California Council on Science and Technology (CCST). Dr. Jessica Parker: Education Community Manager at Maker Ed. With 10+ years teaching in higher education and secondary classrooms, Jessica comes to Maker Ed with a passion for making and the Maker Movement, expertise in the field of digital media and learning, and extensive experience in supporting professional learning networks. She co-founded the Maker Certificate Program at Sonoma State University, where she was previously an Associate Professor in the department of Curriculum Studies and Secondary Education. She is the author of Teaching Tech-Savvy Kids: Bringing Digital Media into the Classroom.Jessica completed her undergraduate and graduate work at the University of California, Berkeley; she has a BA in Mass Communication and a MA and a PhD in Education. Danny Beesley: Founder of Idea Builder Labs and Manager of Laney College Fab Lab. Danny Beesley is the principal founder of Idea Builder Labs. This company initially grew from an increase in demand from industry for hands-on skilled workers proficient in advanced manufacturing, digital fabrication, or science and engineering. He brings a decade of experience in the fields of construction, technology, and education with a focus on digital fabrication and advanced manufacturing. Danny has worked with a variety of clients and organizations, which include colleges, elementary, middle and high schools, school districts, community-based organizations, private businesses and even sovereign governments. Coming from a long line of builders, he brings his unique background in construction and technology to formal education settings. He has expertise in the following areas: strategic planning, project management, community building, lab design, curriculum development, educator training, public speaking, sustainable design as well as numerous 3D modeling programs. Danny also belongs to numerous committees and boards including the Oakland Makers Core Group Managing Committee and is a founding member of the Digital Fabrication Network. Gina Lujan: Founder, Director and CEO of Hacker Lab in Sacramento, CA. Founding CEO of Hacker Lab and Code For Hood, Gina is a Social Entrepreneur. She focuses on community, business, regional, and economic development at Hacker Lab. Gina possesses 15 years' technology experience in web development, and is a repurpose maker. Hacker Lab, having expanded from 750 to over 10k sq. ft. in just six months of being in business, is Gina's primary focus. It is now home to almost 400 residents and a community of over 3000. It hosts 35 to 50 educational focused user groups and classes a month, totaling over 6000 students a year. In addition, Hacker Lab is home to a constant rotation of 13 private offices for startups and dozens of freelancers. Revenue from companies, freelancers, and entrepreneurs is in the millions annually. In less than three years, Hacker Lab has quickly grown to be a grassroots technology hub for the Sacramento region. In addition to her entrepreneurial projects, Gina has worked as a consultant with economic development in rural Tuolumne County to assess the region's innovative community and resources. She also works to solve community problems such as bringing affordable ultra high-speed broadband (gigabit) to the region, and contributes to workforce development efforts by working alongside local government and organizations. She also worked on a stealth project at Northrup Grumman Aerospace Systems as an Innovation Consultant. Gina was recognized as one of Sacramento Business Journal's 25 Business Leaders of 2012 and 2013. She also received an International Women's Day award from the Sacramento Community. In addition, she was named the recipient of the region's highly regarded 2013's Women Who Mean Business Award, Regional Economic Leader for 2013, and a national award for Latina of Excellence In Information Sciences and Technology in 2015. She also serves on regional planning committees for, American River College Art New Media Advisory Board, Next Ed, California Foundation Of Community Colleges, and SETA. The Southern California InnovationMaker3 Symposium was held at UC San Diego on June 16, 2016. The symposium was presented by the California Community Colleges Chancellor's Office (CCCCO) Workforce & Economic Development Division, along with the California Council on Science and Technology (CCST). Dr. Nate Delson, University of California at San Diego, EnVision Maker Studio Faculty Director; Professor, Mechanical and Aerospace Engineering, Jacobs School of Engineering, UC San Diego. Nate Delson serves as a resource for UC San Diego faculty who are creating experiential courses for the EnVision Maker Studio. For more than 16 years, Delson has been educating mechanical engineers at UC San Diego through project-based learning in laboratory settings that combine thinking and making, including MAE 3 for freshman and the capstone course MAE 156B. Delson has taught students how to learn to construct everything from robots to clocks, to medical devices. He is also engaged in programs and initiatives that encourage students to bring their ideas and inventions to market. After his undergraduate degree in mechanical engineering at UC San Diego, Delson earned a Ph.D. in mechanical engineering at MIT. Parker Thomas, Mirus Labs. Parker Thomas is the Managing Partner of Mirus Labs, an educational design studio that helps learning organizations create spaces and experiences that encourage creativity, wonder and learning. He is a cofounder of Urban Montessori Charter School, an Oakland elementary school with 330 scholars based on design thinking, arts integration and the teachings of Maria Montessori. A passionate believer that making things develops creative problem-solving skills, he is also the cofounder of STEAM Factory, an Oakland family makerspace currently building a two-person, 30 mph hovercraft. Prior to Mirus, he built and sold 2 companies, built 2 airplanes and flew them around the country, managed the DARPA-funded MENTOR Makerspace program for Make: Magazine and co-invented Maker Studio, a building toy currently sold in bookstores and specialty toy stores across the country. In his spare time, he makes drones, boats, pens, knives, treehouses and anything else his kids want to make. Xavier Leonard, State of California. Xavier Leonard is a civic technologist, researcher and designer. A graduate of Columbia University, he has been the Public Technology and Data Strategist for the City of San Diego's Civic Innovation Lab, Media and Communications Specialist with the Center on Policy Initiatives and a Senior Fellow in Emerging Technology at the SDSU Visualization Center. He was the founding director of Heads on Fire and the Heads on Fire Fab Lab. That program (now Fab Lab San Diego) was selected as a national model in the United States for teaching technology in out-of-school settings. A proponent and producer of Open Source software and hardware projects, Leonard has spoken on the benefits of Open Knowledge, Open Data and Open Government at the Open Knowledge Festival in Helsinki and Berlin; the United Nations' World Summit on the Information Society in Tunis, Tunisia; the Air Jaldi Summit on Wireless Technologies in Dharamsala, India; the International Summit for Community Wireless Networks; the Nonprofit Technology Network Conference; the Community Technology Center Network Conference; the signature Maker Faires in San Mateo and NYC, TEDx America's Finest City and the Global Fab Lab Conference. As a Kid*Spark Fellow, he investigated the role of play and maker activity in the delivery of STEM education and was Innovator-in-Residence at San Fransisco's Children s Creativity Museum. Leonard has been honored as a Z-Fellow of the Zero Divide Foundation, an Ideas Institute Fellow of the MIT Media Lab, and a TEC Champion by the United States Congress. His design projects have been presented at the Institute of Contemporary Art, Philadelphia; the Institute of Contemporary Art,London; The Henry Art Gallery, Seattle; the Biennial Soundwave Festival, San Francisco; Franklin Furnace, NYC; The Knitting Factory, NYC; and the Centre International Francais, Ouagadougo, Burkina Faso, among other venues. Salomón Dávila, Dean of Economic and Workforce Development, Pasadena City College. Dean of Career Technical Education, at Pasadena City College, began his pursuit of tinkering with programming Logo in his 5th grade class. After solid industrial technology shop classes and a dose of math and science he headed to the Massachusetts Institute of Technology where he continued his tinkering in laboratories, designing data collection systems for graduate students. The Central California InnovationMaker3 Symposium was held at CSU Bakersfield on June 23, 2016. Scott Kramer, Fresno Ideaworks. An inability to accurately gauge the requirements, scope, and work involved with any project has brought Scott Kramer skills and experiences impossibly broader than he ever could have imagined. He is living proof that if you just close your eyes and jump, there's no telling what you can accomplish. Among his stumblings are a 30 year career as a computer geek working for major American corporations and the creation of the Fresno Ideaworks hackerspace. Salomón Dávila, Dean of Economic and Workforce Development, Pasadena City College. Salomón Dávila began his pursuit of tinkering with programming Logo in his 5th grade class. After solid industrial technology shop classes and a dose of math and science he headed to the Massachusetts Institute of Technology where he continued his tinkering in laboratories, designing data collection systems for graduate students.